Want to get even faster performance out of your SAS expander enclosure? If you have an LSI 9280/9286/9286CV controller, you can use an SSD cache. 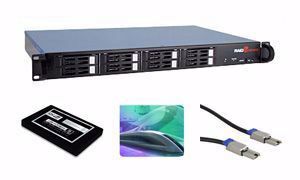 This complete set consisting of a 1U enclosure (cable included), 4 SSDs and LSI CacheCade caching upgrade will provide a significant speed increase for your random-access (small files, database access, exchange and web servers, virtual disks) operations.